You may have seen some of the photos from my rustic glam photo shoot this fall (because I’m obsessed with all the photos!) but I wanted to share with you some of the behind the scenes details and introduce you to the talented ladies who made this happen! Michelle Porter is an amazing photographer with such a great vision. She recently relocated back to North Carolina and is working on growing her photography business locally. I was honored she chose me to model for this shoot! Her best friend Mollie, from Glimmer Hair and Makeup in the Outer Banks, drove in to do my hair and makeup, which I loved (and I am pretty picky about my makeup so this is huge!). It could be because she has been in the industry for 13 years and has done hair and makeup for too many brides to count at this point. She uses great products and can create any look you want. They were both so easy to work with and fun! I can easily see how Michelle gets the perfect picture of the kids she works with because her personality just shines. She also confided she’s not above making funny animal noises or placing things on top of her head to get the best shot! Michelle specializes in family pictures but is expanding more into bridal and modeling portraits too, and as you will see by these pics, you all will want to work with her too! 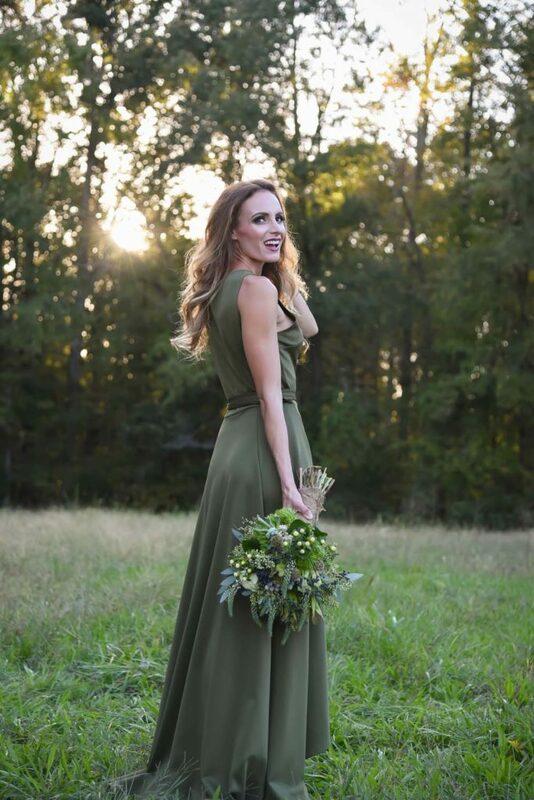 Set in Fisher Farm Park in Davidson, NC, Michelle had me bring three dresses to shoot in for our rustic glam shoot. The first was my banquet dress from 2009 by Mac Duggal Prom. We both loved the idea of a very sequin and glam dress contrasting the natural and rustic backdrops. Climbing on old wood pallets in a barn, shooting underneath big daddy long leg spiders dangling above our heads and tramping out into fields, nothing was stopping us from getting the perfect shots! The next look was a dress from a company I wear often, WantMyLook. This dress was only $50 and the site runs 25% off flash sales all the time! It’s the perfect dress for a fancy dinner (I wore it in Vegas for our Championship dinner with NASCAR last year) and I also had a number of people reach out to me asking where it was from for a bridesmaid dress. We added flowers by Gallery of Flowers with the look to show just how stunning it would be for a wedding! I especially love the contrast of this dress with the brick in these shots! Also, can we please talk about the way Michelle gets the perfect natural sunlight to saturate her pictures?! It’s like everything is glistening. Our final look was for the brides! Imagine how gorgeous your pictures would be in this setting! I kicked off my shoes and climbed up a silo for some pictures and I just kept envisioning how stunning a bride with a long train would be for this look. My favorite picture was just lying in the grass (don’t worry Michelle brought a blanket so you won’t get your dress dirty!) with the barn in the background. Again I love the contrast of a glam dress in such a rustic setting. I have to give major props to Mollie for fixing my hair at the end of the day to finish our shoot. It was so humid out and my naturally curly hair was getting crazier as we went. She whipped out a handful of bobby pins and in 30 seconds created this gorgeous half up-do that would have taken me forever! It’s rare that you come across two such genuine, empowering women so I wanted to share them with all of you today! Please check them out for your photography and hair/makeup needs!